UPDATE: Submissions are due September 22 – submit your entry here! There is an amazing community of software developers in the Philadelphia area, now ranked one of the top 10 cities for tech startups! Created by one of the most vibrant and concentrated set of higher education institutions in the world, these talented developers are harnessing the newest waves of technology to revolutionize the world. Big companies have a unique opportunity to tackle big problems—like curing cancer, or making water available to every human on the planet, or making sure people have enough money to live comfortably in retirement. The Greater Philadelphia’ region is home to some of the most vibrant 21st century game-changing industries like Healthcare, Financial Services, Media & Telecom, Government Tech, and Physical Infrastructure. New $25K Challenge Added for Water & Utilities! Developers need customers and companies need innovation. It’s a no-brainer that these two groups should be working closely together, but for some reason the connection hasn’t been made to date here in Philadelphia. The Philly Enterprise Hackathon sets out to shift this paradigm by identifying some really big problems facing companies that developers could be rewarded for solving—and maybe even turn into viable products or companies. Many Hackathons encourage developers to come up with their own ideas for useful products. The problem with that is that there may or may not be customers after you do a lot of work. 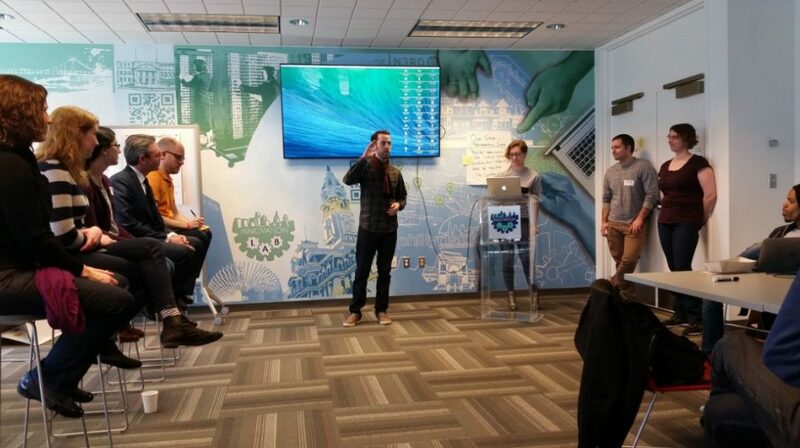 The Philly Enterprise Hackathon brings the enterprises in front of the developers with specific problems they need solved—accelerating the likelihood of the first customer. Enterprises will present their “problems” and challenge the developers to come up with a viable solution. Hacking will occur over a two and half week period – with scheduled meet-ups in between. The two winners will each receive $50,000 along with incubation at VentureF0rth for 4 weeks with the company, a venture capitalist mentor and a local entrepreneur mentor. At the end of the process, the enterprises get the right to run a version 1.0 of the developer’s product. Information on the terms and conditions and investment funding that the developers may decide to pursue to start a company. We are excited because this is an opportunity for two important communities in Philadelphia to work together. We are excited because this collaboration reinforces what everyone already knows—Philadelphia has talent and access to customers—two of the most important ingredients for building a successful business. We are excited because enterprises have an opportunity to get some incredibly innovative solutions for some very big problems. In addition, developers are rewarded, recognized and supported for their work. Maybe all of this goodness will create the next great enterprise software company! If that is not your business, you can try something else, maybe to create a website about the best online casino bonuses or the best poker games. There are plenty of opportunities in front of you.